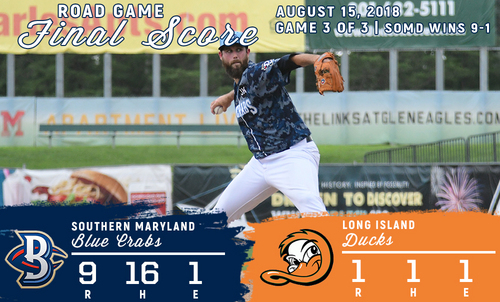 (York, PA.., Aug. 5, 2018) - The Southern Maryland Blue Crabs (9-14) won the series opener against the York Revolution (11-13) 9-8, a game that began on Friday and was resumed this afternoon. The Blue Crabs offense exploded right away, putting up six runs in the top of the first. Teodoro Martinez doubled on the second pitch of the game, immediately coming around to score on a single from Edwin Garcia. Back-to-back singles from Frank Martinez and Jon Griffin loaded the bases, with still nobody out in the inning. A fielder’s choice from Angelys Nina put an out on the board, but also allowed Garcia to score the second run of the inning. A single from Angelo Songco brought home Griffin, before Dominic Severino (4-7) hit Cory Vaughn to load the bases for a second time in the inning. A single from Craig Maddox followed, bringing home Nina and Songco for two more. A fielder’s choice from Rosario put Vaughn across, putting the score at 6-0 with the Revolution finally coming to the plate. The Revolution began the long road back with a pair of runs in the bottom of the inning. Alexi Casilla singled with one out in the inning but was replaced at first by Melky Mesa after a fielder’s choice. Telvin Nash then launched a two-run homerun in his first at-bat for York of the season. Frank Martinez responded with a solo homerun in the top of the second, pushing the Blue Crabs lead back out to five. Drake Britton settled in on the mound for Southern Maryland, working two straight scoreless innings. However, the Revs got their offense going again in the fourth, with Nash doubling to lead off the inning. Two batters later, Luis Cruz would add a single to bring Nash home from second. Ryan Dent would single to move Cruz to scoring position, setting up a two-out single from Jose Cuevas that would cut the lead to 7-4. Michael Click, who came on for Severino in the first inning, was incredible on the mound for York. The reliever retired the final 12 batters he faced, sending the game to the middle of the fifth. Nash crushed another homerun in the inning, a two-run bomb that put things at 7-6. That’s when the rain hit, sending the game into a delay. The weather was ruled unplayable for the remainder of the night, with the game being suspended after 4.5 innings and set to be picked up Sunday beginning at 1 PM. When the game resumed on Sunday afternoon, Southern Maryland sent Chris Mazza (2-0) to the mound in relief with the one-run lead. After a scoreless bottom of the fifth, Craig Maddox added one to the lead in the sixth with a solo shot, his first homerun of the season. Dent would counter in the bottom of the inning, picking up a solo homerun of his own to put the score at 8-7. After a silent seventh inning, the Revs mounted a threat in the bottom of the eighth. Welington Dotel singled to lead off the frame, then moved first-to-third on a single from Luis Cruz. Alonzo Harris pinch-ran at first for the catcher Cruz, immediately stealing second to put the go-ahead run in scoring position. Mazza was unfazed, getting a strikeout, groundout, and popout all in a row to strand the tying and go-ahead runs in scoring position. Southern Maryland added another in the top of the ninth, putting an insurance run on the board. Garcia doubled to start things, moving up to third two batters later on a flyout from Griffin. A two-out single from Nina would bring Garcia home, giving closer Cody Eppley (S,10) a 9-7 advantage. Eppley allowed a double to Mitchell as the leadoff man in the bottom of the ninth. Mitchell moved up to third on a groundout, where he would score on a wild pitch to cut the Blue Crabs lead to one run. After a strikeout, Nash drew a walk to bring Dotel to the plate as the winning run. Eppley recovered to get a groundout to third, ending the game in a 9-8 win for Southern Maryland. The Blue Crabs return to action immediately for the series finale against the Revolution. First pitch is scheduled for 3:00 P.M. on Sunday at PeoplesBank Ballpark.